What do you do when you have a mind-boggling 232 million monthly active users coming to your site but not adding anything to your revenue? Obviously try to make sure they loosen their purse strings. Well, microblogging site Twitter seems to be precisely doing that only. Twitter is exploring ways to sell products directly from the 140-character tweets, the one-to-many text messaging service site is famous for. This development of Twitter is reportedly going through in partnership with an e-Commerce site Fancy.com. 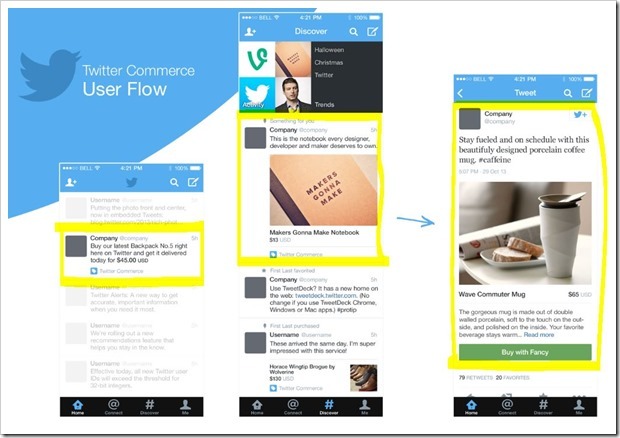 Re/Code recently revealed a screenshot of the probable design of upgraded Twitter that included some tweets tagged as ‘Twitter Commerce’. 1 How Will It Happen? 4 Will Twitter ever make profit? Fancy.com is an innovative ecommerce experience. It already allows you to add its buttons to your blog or site. Similarly, the Twitter Commerce tags will expand to a large green button named as ‘Buy with Fancy’. From that button, a purchaser will be able to enter their payments and shipping information. And, all this will happen without even leaving the Twitter site or app. Users could use the “discover” tag to find new things to buy, see detailed images and descriptions on a sale page and track purchased items on a map. Twitter would store all the credit card information and addresses securely within its mobile app and the products would be delivered the same day. We are not clear what will be Twitter’s fees or commission on selling products directly from its social networking site. Fancy.com already gives 10% credit for its affiliate program. Also, it is apparently the first partner of Twitter in this project. Twitter may also approach other ecommerce sites for the same. Why Fancy: Fancy is an ecommerce site which has always stressed its social side. Looking like the online scrapbooking site Pinterest, with lots of large, well-curated pictures, it integrates with social networks including Twitter and Facebook to encourage people to share what they want and what they have bought. Plus Twitter founder Jack Dorsey is an investor and board member of the site. Not really. Social networking giant Facebook attempted a similar move in September 2012, when it launched the Gifts spin-off that allowed users to buy physical goods from the site. However, it scrapped the scheme after less than a year due to a lack of user demand. Even retailers’ own attempts to set up shop on the social network were made in vain with the likes of Asos, Oasis and Gap, closing their transactional Facebook stores. But Twitter’s push into e-commerce actually builds on last year’s “pay by tweet” experiments in partnership with American Express, letting its cardholders make purchases by including promotional hashtags in their tweets. The users just tweet a confirmation and their transaction is completed. Will Twitter ever make profit? According to analysts’ predictions, Twitter’s losses in 2013 more than doubled to $140.9m, with a $14.82m loss in the last three months of the year. But revenues are forecast to have increased at a faster rate, rising from $316.9m in 2012 to $640m last year. Twitter has so far generated the vast majority of its revenue from advertising only. The social network giant is seriously under pressure from investors to produce new revenue streams. This shouldn’t come as a surprise to the industry watchers as Twitter had last year hired former TicketMaster CEO Nathan Hubbard as head of commerce, to be charged with developing a way of integrating a way for people to buy things through the micro blogging platform. Also, Twitter has signed a patent cross-licensing deal with IBM and bought over 900 patents. Findings from a recent Market Force survey detailed how 81% of surveyed consumers cited social networking recommendations as having a direct impact on their purchase decisions. While shopping in-store or online, the quickest place to receive trusted opinion is often from your close contacts within your network. As of 2013, more than 60% of Twitter users accessed the Twitter app and the site through their mobile phones (that’s over 100 million people). Also, US shoppers conducted over $38 billion worth of eCommerce transactions via mobile devices as of January ‘13. Engaging customers on social media and convincing them to buy are two totally different things. It all depends on how well the social giant is able to gel the gap between the two. So now that Twitter has put its best foot forward, will it be able to break the curse of ‘no-revenue-from-social-media’ and start raking it profits? Only time, nay, trends will tell. If and when social media users decide they are ready to shop, Twitter is clearly keen to capitalize.